Regatta Director Iain Murray will lead a review into the events surrounding the capsize of Artemis Racing’s first AC72 and the subsequent tragic death of crewman Andrew Simpson. During training on San Francisco Bay yesterday, Artemis Racing capsized in winds between 18 and 20 knots. The boat broke apart and Simpson, 36, became trapped. Support vessels on site rushed to recover the crew from the water and it quickly became apparent that Simpson was missing. After he was retrieved, CPR was administered by trained professionals, both afloat and at the dock, for more than 20 minutes. Approximately 30 minutes after the incident, he was pronounced dead. “It was less than 24 hours ago when this accident happened and the pain is still very acute for everyone involved. Our condolences go out to Andrew's family and friends, and the members of Artemis Racing,” said Stephen Barclay, chief executive of America’s Cup Event Authority, at a press briefing this morning. “It’s too early to speculate about the causes of the accident. Iain will conduct the review and will liaise with the San Francisco Police Department and the United States Coast Guard and any other third-party experts as necessary,” Barclay said. Murray is a veteran ocean racer and America’s Cup sailor, having been part of four America’s Cup campaigns. His knowledge of the sport is thorough and he declined to speculate on the causes, or prejudge the results of the review. Artemis Racing chase boats were assisted in the recovery effort by members of Oracle Team USA, Emirates Team New Zealand and Luna Rossa Challenge 2013, all of whom were on site observing the training session. “This is a tragic reminder of the challenges faced by sailors on the water, whether they’re commercial sailors or recreational or professional sailors,” said Captain Matt Bliven of the U.S. Coast Guard Sector San Francisco, which will liaise with Murray on the review. “It also underlines the importance of adequate training and proper gear to minimize the impact when something goes wrong. That’s something we’ve consistently seen from the America’s Cup organization and the participating teams – their level of preparation and training to avert these types of mishaps,” Bliven said. No timetable has been placed on completing the review. The San Francisco Police Department is also conducting its own review as normal procedure when there is loss of life. 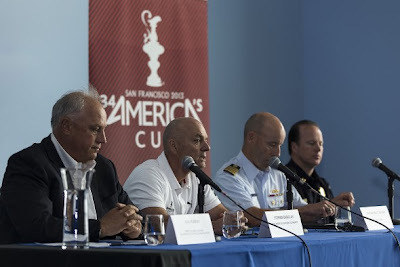 Pictured at top (from left) – Regatta Director Iain Murray, ACEA CEO Stephen Barclay, Captain Matt Bliven, US Coast Guard Sector San Francisco, and Captain Thomas Cleary, San Francisco Police Department, address the media at a press conference on May 10, 2013, in San Francisco.